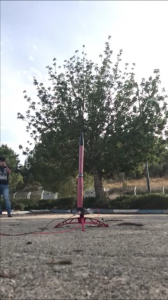 During the undergraduate course of Rocket Propulsion, students learn to calculate and evaluate the performance of different rocket motors. They are introduced to the rocket equations of motion, to single- and multi-stage rockets, examine the chemical reactions inside motors, and study the different types of propellants and propulsion systems. In addition, students participate in a demonstration in which a model rocket built and assembled by their teaching assistant is launched. 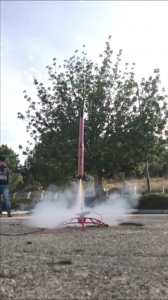 In this demonstration, a small rocket motor is ignited to launch the rocket model, which later lands using a retractable parachute. The students are required to submit a report calculating and evaluating the rocket’s maximum altitude. To watch the launch, click here.